This morning on my Trek I cycled on my Schwinn 150 21.2 miles. I burned 605 calories. Since April 6 I have been averaging daily, 604 calories. Today I cycled along the Trans-Canada Highway to a location just north of a family of Lakes: Gander, Goose and Gosling. I am actually due north of the kid, Gosling Lake. All-things-being-equal, at this meridian of Saskatchewan, it does not appear that the scenery changes all too much. Today I have now completed my sixth month of my Trek on my Schwinn 150. Yes I am a wee be amazed that I have cycled every day excepting one. I have noticed some drastic as well as some subtle changes to this 61 ½ year old body and mind. And I am definitely better for the wear… My next appointment with my Cardiologist will most undeniably realize some positive reactions. I am amazed this morning. Google News listed only one, yes that is correct, only one sports headline on their summary page of local news for Tampa, Florida. Typically it is up to and well over 50% of the number of headlines are sports related. Today only 1 out of 20. I am flabbergasted. An article by Eric Black caught my eye on the MinnPost site – “With Bachmann not running, Jim Graves pulls out of the 6th District race.” Accordingly Mr. Graves states, as reported, “Basically, after all that’s gone on, and with Michele Bachmann now stepping down, I’ve been talking to my friends and family and frankly, the feeling is, ‘Mission Accomplished.’ She wasn’t representing the people of the 6th District appropriately, and now she won’t be representing them. There’s no way anyone could run and win who would be worse than Michele Bachmann. So we accomplished that task… I’m not a politician; I’m a business guy,” he said. “Now there are zero things on my agenda that I feel a need to do in public life.” I salute Mr. Jim Graves. A politician with a goal set… A goal accomplished!!! 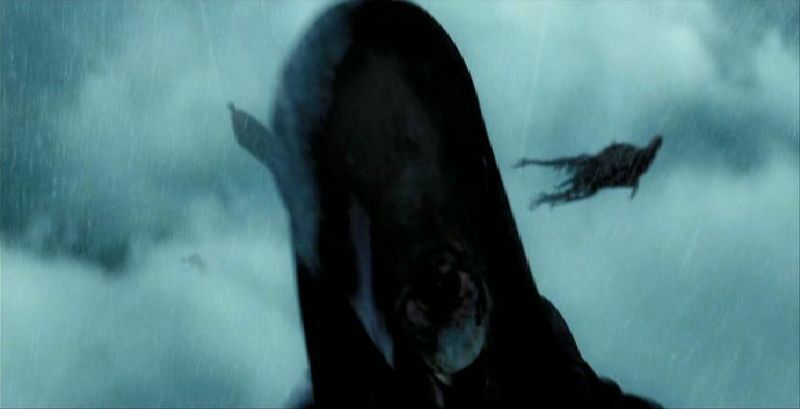 Part two of Harry Potter and the Goblet of Fire included the second two challenges of the Triwizard Tournament… Mermaids, funky half-human octopus type things in the water, and an attacking hedge in the maze corridors. Our work is progressing astoundingly well in the incorporation of the planets and stars with the background fabric of our Astro-Physics quilt and wall hanging. Thirteen more inches on Double Entendre afghan to go. Yesterday I spent some time working on the scheduling of our efforts, quilts and afghans. Follow our progress and updates at Quilts SB. I am still in Saskatchewan on my 177th day on my Schwinn 150 Trek. Today I completed another 21.5 miles and I have now clocked a total of 3,253.3 miles. I am on the Trans-Canada Highway just north east of the City of Swift Current, Saskatchewan. The population approximates 15,500 and it is about 2,450 miles from my home in Tampa, as a crow flies. Ate supper last night at I ai Sushi. 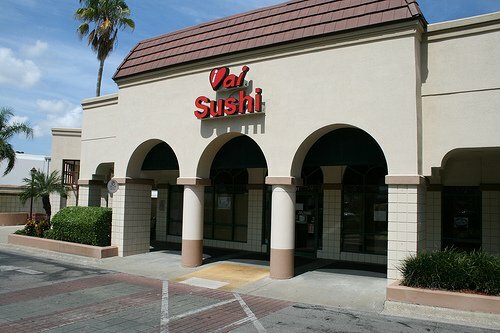 It is a dive but a relatively fair sushi and Japanese restaurant in Tampa. It is a hole in the wall decorated in the ultimate of Dollar Store “tackiness” and post-its with today’s specials all over the walls… It is the only place in town that I know of to get freshly made Okonomiyaki. Would I get the sushi or sashimi there again? Probably not… but there are many other interesting items I would probably try, especially with labels that I really do not have an inkling of what they are. And all the tables were taken. But it was the Chocolate Delight stuffed in a chocolate-dipped waffle cone at Cold Stone afterwards that definitely increased my sugar blood count this morning. And this morning I can say that I have dropped 8.8 pounds due to my daily Trek on my Schwinn 150. Harry Potter again this morning. The first part of Harry Potter and the Goblet of Fire. This is the fourth of the eight films. Introductions to Bartemius Crouch, Cedric Diggory (late of Twilight fame), Mad-Eye Moody, and students of two other European schools of magic. I am amazed at the creative mind of J.K. Rowling as bit by bit the story continues to unfold. The Triwizard Tournament most definitely is facsimile of a typical school competition, but one can see certain similarities in theme and plot followed up in the Hunger Games. "You all have been in my mind so much lately. Thank you from the bottom of my heart for the pic. That little dog was always so special to me...all he needed was the right family and I never doubted for a second you two weren't the right family for Max. 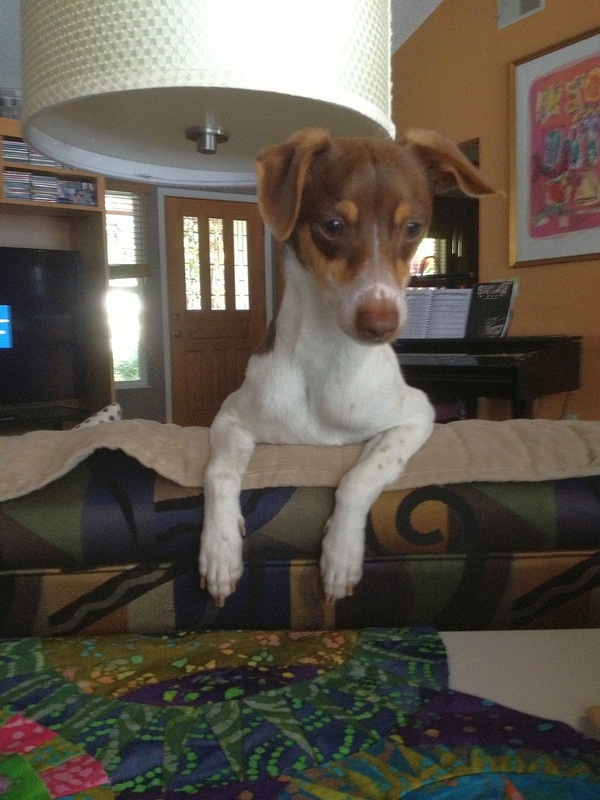 He is a very lucky little dog, coming from a crack house in Miami to the loving arms of you two. His little buddy wasn't so lucky. 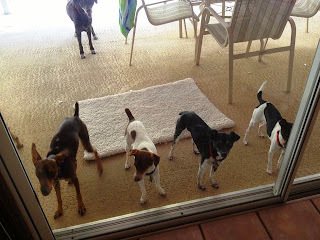 They abused that little dog so much until they broke his back, and he had to be put down. He couldn't be saved but we did try. I talk about Max all the time about what a lucky little dog he is and what a wonderful home he got. I'll always love both of you for loving him and making him a part of your family." This morning three of The Pack are seated with me in my chair at my PC. The brouhaha of the early morning wake-up and guzzling down of the Kibble is over. Everyone except yours truly is quiet and settling in for their morning siestas. This morning’s Trek cycling takes me 21.0 miles further in my journey. I am on the Trans-Canada Highway in Saskatchewan just south of the Town of Herbert. The population is about 750. It is also the home to the Herbert Stampede. In the far distance I can see the provincial border. And now for my soapbox - His extreme and unctuous potentate, the current Governor of Florida has now signed the wimpiest and most ineffective law, as created by the current sitting Legislators. It is Florida's "No texting and driving" law. Our Florida officials cannot present citations specifically for texting while driving, but have to stop a driver for some other reason in order to cite the secondary charge of texting. Guess this State will NEVER get out of the Dark Ages. It was not until about the year 2000 that the open container law became effective for operators and passengers of motor vehicles (FS 316.1936). Do not expect Florida Legislature to be at any point up-to-date and comprehensive of any real issues of any thing... especially something as dangerous as texting and driving. Supper last night – Cheese Ravioli with Sausage, Onion and Peppers; Salad – Watermelon, Spinach, and Feta. The thing is the food is really good, especially the Watermelon Salad. Previously I was not a fan of watermelon… and now I am trying to discover and explore ways to make it be the primary ingredient in a dish. So far, two for two. The work on the cluster for Astro-Physics has been completed. Now the placement of the remaining planets and stars on the background is next on the bill-of-fare. Double Entendre is now 40” long. Only 20” to crochet on the inner top. Check out progress at Quilts SB. Today’s Trek cycling on my Schwinn 150 was briefly interrupted by an electric power company blackout. Damn TECO! One would think that after living in this house for 29 years Tampa Electric would get it right. So far these past two weeks, there has been a power surge almost every single day. But if I digress into the benefits, or lack thereof, of TECO my blood pressure will begin to escalate. Adding the two pieces together, before and after the power surge, I cycled on my Schwinn 150 21.5 miles. I burned 621 calories. Today I am still in Saskatchewan, and on the Trans-Canada Highway. Last night’s supper was grilled Italian sausage; corn on the cob; and a Tremendous, with a capital "T", kidney and pinto, watermelon, and onion salad; and apple pie with cheddar cheese. I would definitely make the salad a second time. After 10 days of reduced diabetes medication, my blood sugar levels average 103.1 mg/dL. And today is not necessarily a special day for those who have a great hunger … It is Hamburger Day. I did that on Monday; grilled, and I had two. They tasted so good, with cheese and tomato and onion and lettuce and pickle and mayo and potato sticks… And I like hamburgers. But I have to keep saying to myself 44 down to 34-and-a-half. Working on some new quilt proposals/commissions. You’ll have to tune into Quilts SB to discover and read the forthcoming updates. And we still have our critics... to the Max. Today I cycled 21.5 miles on my Schwinn 150 on my Trek from Tampa to Seattle. I am somewhere in Saskatchewan on the Trans-Canada Highway at a point almost halfway between Pelican and Chaplin Lakes. The landscape has changed a wee bit, sort of like low-lying rolling hills. And I am about 469 miles from my next Interlake address goal. I have now lost 9.2 pounds and I seem to be maintaining my reasonable ranges of blood sugar numbers, even with the reduction in my diabetes medications. The above map is an approximate and direct route map of my Trek on this 174th day. It does not include all my Interlake address goal points. "A" is Tampa, "C" is Seattle, and "B" is where I have made it today. To date I have completed 3,189.3 miles. And today is also Cellophane Tape Day. 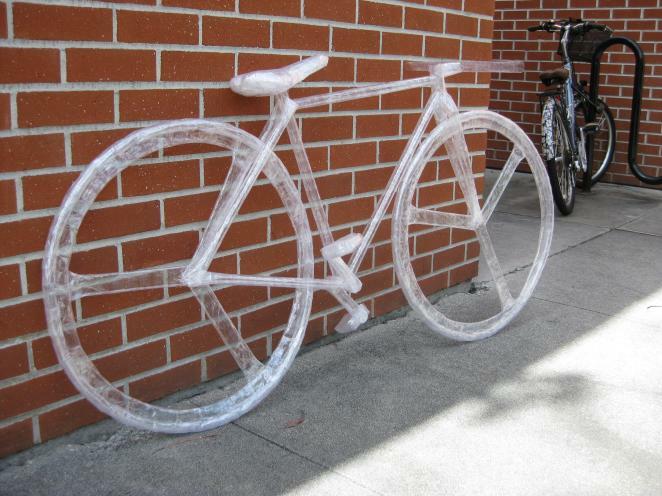 I just learned that there are Scotch Tape Sculpture contests. Contestants are judged on: Execution; Creativity; and Presentation. Grand prize $5,000.00. Only in America… Go for it! 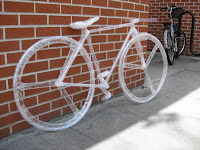 And yes the bike was one of the 2012 winners. This morning’s Trek on my Schwinn 150 resulted in 21.4 miles. I am now about 15 miles west of Moose Jaw, Saskatchewan and travelling on the Trans-Canada Highway once again. 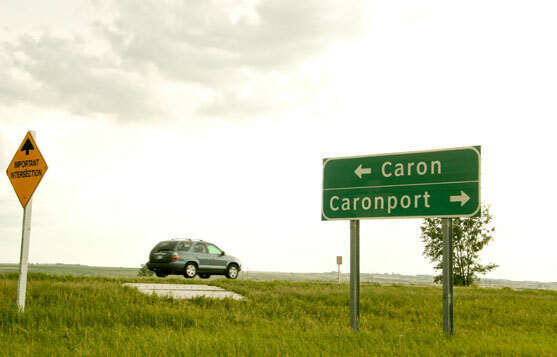 I am also just northwest of the Village of Caronport. It has an approximate population of about 1,070. And as I continue on my Trek, I believe the start has just happened at the Indianapolis 500. I’m sure that my Schwinn 150 would get a definite workout. Housecleaning and today is a beautiful day in Tampa… Sun is shining and the humidity is almost non-existent. I just got out of the pool. Today’s on-bike entertainment is the second film in the Harry Potter series – Harry Potter and the Chamber of Secrets. 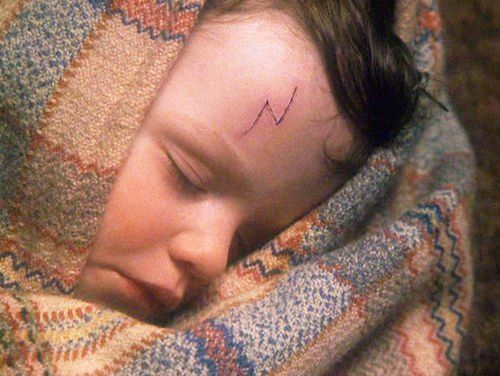 And I have to make sure that I note that the first Harry Potter film does have two names: Harry Potter and the Philosopher’s Stone, and Harry Potter and the Soccer’s Stone. Same film different titles. Today’s film introduces Dobby, the House Elf, and Moaning Myrtle, and Professors Gilderoy Lockhart and Pomona Sprout. Last night’s movie fare was Life of Pi, 2012. 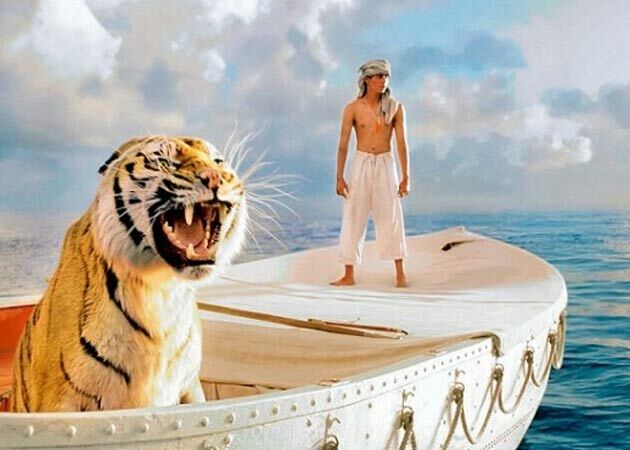 An interesting adaptation of a story, possibly within a story, about the account of a young man and a tiger who survive 227 days in a lifeboat in the Pacific Ocean. There are a number of themes running through the tale and it definitely is something to think about. Work on the cluster for Astro-Physics, the inner top of Double Entendre, and the quilting for The Amulet continues. Check out updates on Quilts SB and stay tuned for my new, soon-to-come site, Afghans SB. I’ve been a wee bit tardy on posting of Jim's Trek on my Schwinn 150 today. Just back in from my SAQA meeting. BUT, I did complete my cycling this morning of 20.5 miles, and I burned 609 calories. I am still in Saskatchewan and the landscape is still somewhat boring… unless you like flat land. 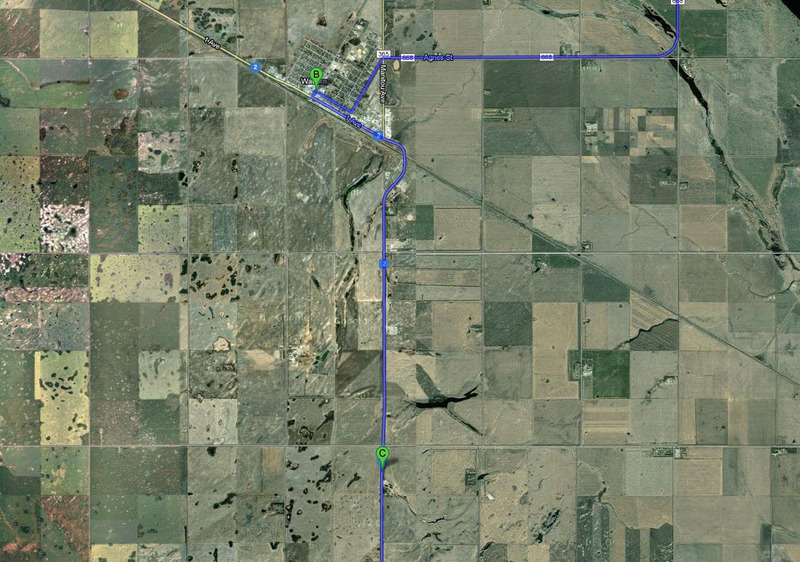 I am headed south on Highway 2 and just about five miles north of Moose Jaw. At Moose Jaw, tomorrow, I will turn toward the west, once again in the direction of my final goal of Seattle, Washington. I have now completed 3,146.4 miles on my Schwinn 150 Trek. Very interesting movie last night, Cloud Atlas. 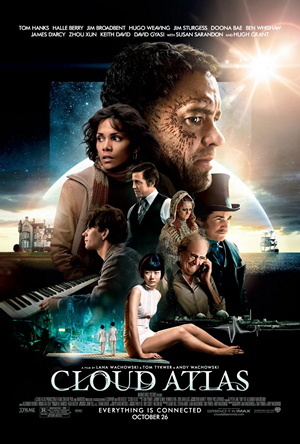 This 2012 film with Tom Hanks, Halle Berry, Jim Broadbent, Hugo Weaving, Susan Sarandon, Hugh Grant, to name a few, is a trip through time with six stories through seven time periods. 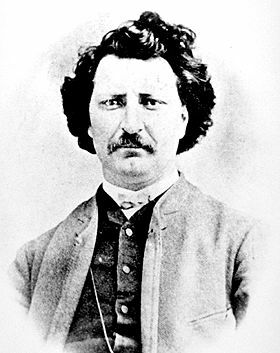 The stories begin in 1849 and continue through 2321. All the tales and human histories are interrelated and interwoven. It is that type of film presentation that I know I will have to watch again, and again. This morning’s viewing pleasure on my Trek was the 3rd part of the first Harry Potter film. 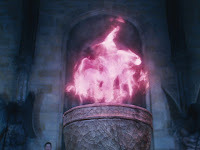 It is amazing, when one takes some time to think about how the Harry Potter films will not necessarily ever get old… that is unless the films of the near future will be of a holographic genre. I remember seeing my first holographic presentation, of a ballerina, in a museum in Fredericton, New Brunswick. I was thoroughly amazed and intrigued. The top, without borders, of our new Double Entendre Afghan is now half done. All-things-being-equal I should be able to finish the second half in a couple of days. Work progresses on the design of the quilting pattern for our new quilt The Amulet. Design continues on Tampa Kaleidoscope. Follow our progress on Quilts SB. After today, I now have 1,070.3 miles remaining in my Trek to my final destination of Seattle. Based on my calculations at my average rate of 18.5 miles a day I should make it to my Seattle endpoint in about 58 days. That should be somewhere around Sunday, July 21. We’ll see… I do have two more Interlake address goals before the final one. It is near to impossible to type with my keyboard when there are three of five of The Pack sharing my chair, and one is at my feet. It’s so nice to be as wanted… but I know there is just the anticipation of circular bowls filled with breakfast chow that are dancing through their wee little heads. 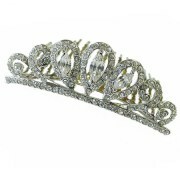 Today is International Tiara Day! And boy do I have to hold myself back from the thoughts and comments that are just racing around in my head. Harry Potter and The Philosopher’s Stone introduces 9 3/4s, Hogwarth, Mountain Trolls, Quiditch, and Fluffy… It looks like the first film of the series will take three days of cycling to complete. I am also amazed at those parts and gems that I may have missed the first time around. Today I cycled, on my Schwinn 150, 20.7 miles. I burned 601 calories. To date my total miles equal 3,105.2, and I am still en route to Seattle, Washington. On this 170th day of cycling I am currently still located in Saskatchewan headed south on Highway 2. There is no one around and the scenery appears to be the same. I now have 552 miles to go to get to me next Interlake address goal. Supper last night, and the tables were filled – Gyoza, Sesame Ginger and Garlic Spiced Rice, Japanese Cucumber Salad, and Steamed Buns. After five days of reduced diabetes medication I’m still maintaining a reasonable, and in the normal range, blood sugar level. 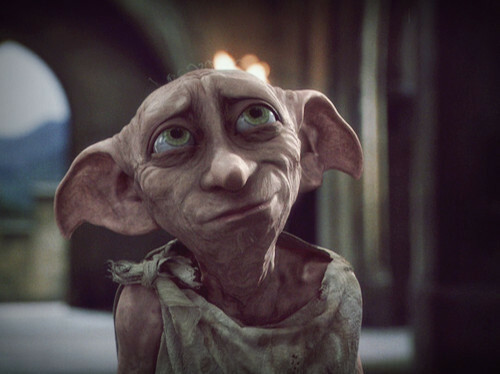 And I decided that for my viewing pleasure I would watch, once again, the Harry Potter movies. These films, all-things-being-equal, should keep my attention fixed for the next couple of weeks. 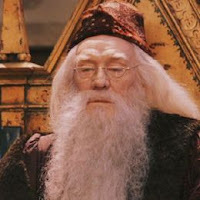 The first one is Harry Potter and the Philosopher’s Stone, 2001. The question is – Where would we be without Captain James T. Kirk and Mr. Spock? 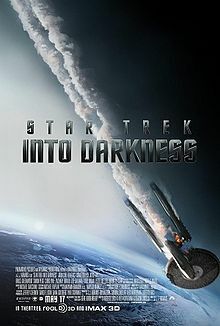 Star Trek Into Darkness, 2013, IMAX and 3D, definitely entertaining couple of hours… and it is enjoyable when something has been a viewing experience in my life for so, so many years. Our work continues on The Amulet. We are now testing quilting patterns to find the ones that complement the construction of our work. The hexagons are being added to the Tampa Kaleidoscope design. Double Entendre, our new afghan, is now just about half-way complete. Thus far two pounds of yarn have been crocheted. Check Quilts SB for details. Day 169 – Jim’s Trek – 21.6 Miles – 34 ½ Inches. This morning I completed 21.6 miles on my Schwinn 150. I burned 602 calories and my belly measurement today is down another half-inch. 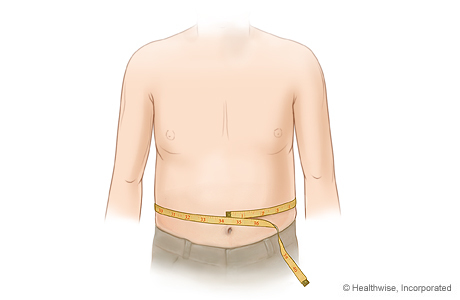 My waist has now reduced to 34 ½” from the 44” when I started my Trek on December 2, 2012. Guess I am going to need some new shorts and pants shortly. Today I am located in Saskatchewan on Highway 2, just south of the Town of Imperial. 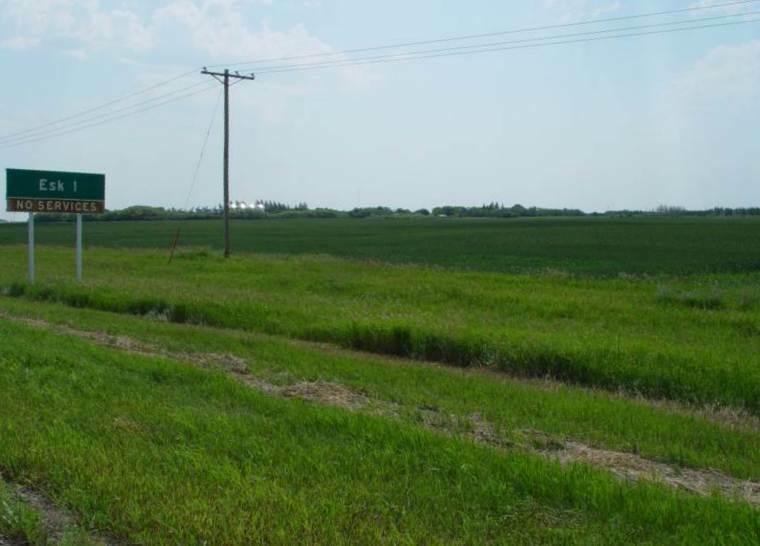 Imperial, population in the vicinity of 350, is about halfway between Saskatoon and Regina. 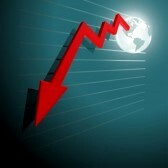 The following is a graphical summary of my 22 Interlake Goals. This morning I finished the second part of the animated film Brave. Not bad but very Disney. Not much more to report this morning. I have been checking up what and when I should eat immediately after my strenuous cycling workout. Thus far I have found that I need to eat something between 15 to 60 minutes after I stop. Time for me to research. It is with heavy heart that I ride today, thinking about the victims, children and parents, affected by the devastation from natural forces in Moore and Oklahoma. My thoughts are with all. Today my cycling, on my Schwinn 150, has reached my 22nd Interlake address goal. 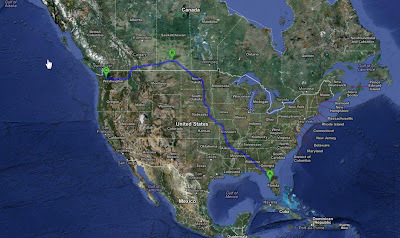 A direct connection from Tampa – 2,043.0 miles; via my Trek – 3,058.3 miles. My 22nd Interlake goal appears to be more of the name of a business, Interlake Human Resources on Main Street, I believe, in Watrous, Saskatchewan. The population of the Town of Watrous is about 1,900. And yes, I used to work with RBC. All Saints Anglican Church in Watrous is known for one of its stained glass windows; the West Window, which brought over from England in about 1912. 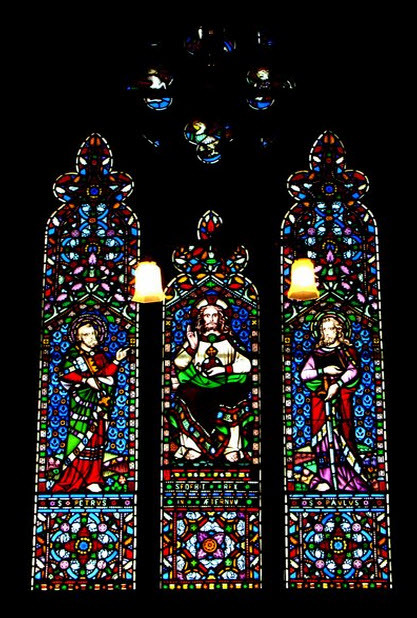 Check out the details at the Institute for Stained Glass in Canada. This site may provide a key for me to locate a stained glass window that was placed in Westmount, Quebec in the name of my uncle James D. A. Robertson, my namesake and eponym. My total miles today equaled 3,062.9. I am located at the "C" marker on the Google map. It appears that the Google Mobile Imaging Vehicle must have missed a small section of the road on Saskatchewan Highway 2. Obviously I am headed south. My next Interlake goal is now about 594 miles away, en route to my final goal in Seattle, Washington. 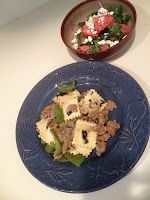 Supper last night resulted, coupled with the exercise, a blood sugar reading of 95 mg/dl. Supper was Shrimp and Rainbow Chard from Urban Oasis, onions, garlic, oregano, fire-roasted tomatoes on a bed of parmesan, basil polenta. Our quilt PJs and Packages went to its new home last night… Work continues on the construction of Astro-Physics and the preliminary design of Tampa Kaleidoscope. Check details at Quilts SB. Keeping with a northern, albeit a highland theme, this morning’s viewing pleasure is the animated film Brave. A true to form Disney princess-type story in Scotland with a witch and a talking bear. Same theme, with red, curly, long, and disheveled hair… but she turns her mother into a bear. Yes my viewing pleasure is one of many tastes. And the monsoon season in Tampa, and Florida. I took a quick image on my iPhone of the ominous thunder clouds amassing during the day. Congratulations to CS on the new promotion. This morning I cycled a wee bit farther than normal, 21.9 miles and I am in Saskatchewan on Highway 668. I am located on Canpolex Road, east of the Dellwood Reservoir. Definitely not a too trafficked road, the way I like it. I’m headed in a southerly direction and am now about 17 miles from my next Interlake address goal. Here are my current stats on the 167th Day. Blood sugar count this morning: 99… down from 128 yesterday. Day 2 of 75% reduction in diabetes medication. Here is a question – I’m not a blue-blood fan of Yahoo. I use Tumblr. Yahoo is rumored to be in position to buy Tumblr for $1.1 billion. Should the purchase go through, will I continue to use Tumblr? I also use Tumblr for Jim’s Trek, A Genealogy Hunt, and Quilts SB. I finished the second half of Valhalla Rising on my Trek this morning. Most certainly not a film for the faint-of-heart. As I watched, it reminded of elements of Ingmar Bergman’s Seventh Seal. And I missed Game of Thrones episode last night as I was watching PBS’ Mr. Selfridge. Thankfully I have On Demand and I was able to see the first part of the next episode of Game of Thrones. And truthfully I enjoyed the Mr. Selfridge which can be considered on par with Downton Abbey. 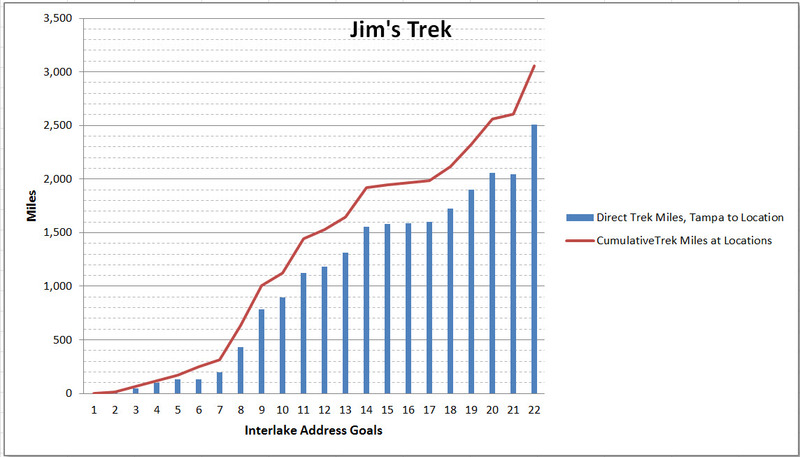 Day 166 – Jim’s Trek – Alleluia! 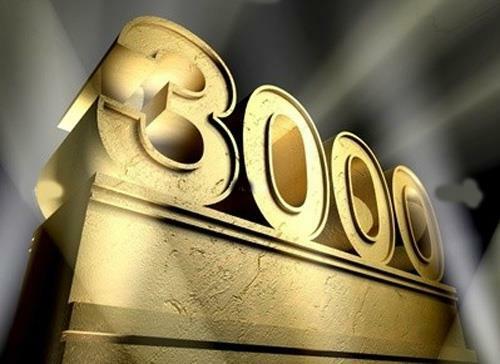 3,000 Miles – Yeah! Day 166 on my Schwinn 150 and I top 3,000 miles. I never thought I would do this. My total miles to-date: 3,019.0. 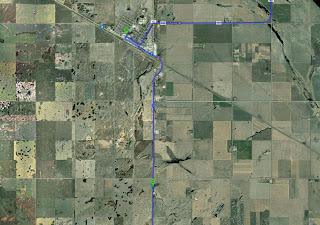 I am located on the Trans-Canada Highway at Esk, Saskatchewan. From my search and observations, Esk, on the Google mapping application, is a Hamlet. Not much there, and I can’t even find a population count listed. It appears that any Esk numbers may be included in the Jansen, about 6 miles away, numbers. Flat land and farms distantly placed apart. And of course this is where I stopped for the day… The sign does warn me that there are “No Services”. I now have about 40 miles to go to get to my next Interlake address goal, and 1,148 miles to my ultimate goal in Seattle. Okay, I do get stymied from time to time. Today is May Ray Day. Weather permitting, accordingly this is the day of May, with any excuse, to get outside and enjoy the sunshine. And yes the sun is shining here in Tampa, and yes I have been in the pool. No discernible information as to who, what, where, when began May Ray Day. I definitely can understand the why. Today is also National Devil’s Food Cake… Not a good celebration when one is trying to reduce one’s diabetes medication. Bah, humbug! Doctors have agreed on the reduction of my diabetes medication. I am now taking only 25% of what I was taking when I started my Trek. I will be monitoring my blood sugar counts for the next month to see if there is a positive trend resulting from my exercise and diet. Counts were up a wee bit this morning, but I sort of expected that with the first day of the change. I definitely will now be aware of fried foods. 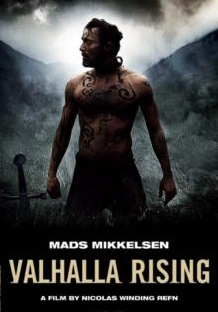 This morning’s viewing pleasure, first part, is the 2009 film Valhalla Rising. The star is Mads Mikkelsen who is currently involved in the television production of Hannibal. 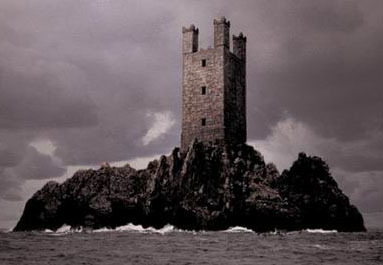 Valhalla Rising takes place about 1000 AD about a one-eyed Norse warrior and his travels. The goal is a crusade but they seem to get lost. A very strong visual presentation with minimal dialogue. Immediate work continues on our Astro-Physics, Tampa Kaleidoscope, The Amulet, and Double Entendre. Stay tuned to updates at Quilts SB. Today my cycling completed 20.5 miles. I am located on the Trans-Canada Highway in Saskatchewan just south of Big Quill Lake… (which of course, I initially read the map as Quilt Lake.) 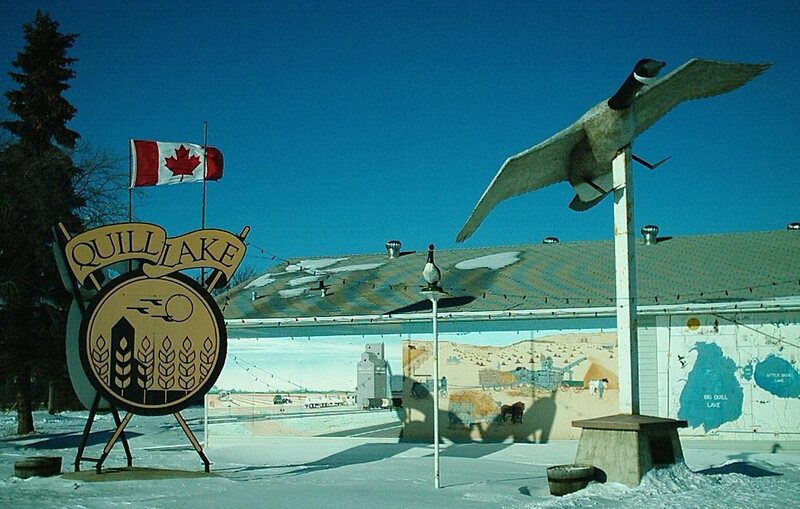 Quill Lake, a village on the northwest of Big Quill Lake and Little Quill Lake is known as the “Goose Capital of Saskatchewan”. Tomorrow I will hit another milestone in my Schwinn 150 Trek. Stay tuned. 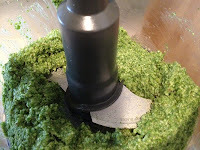 Supper last night included homemade Kale Walnut Pesto. Sausage Tortellini with Kale Walnut Pesto. Buitoni sausage tortellini… Pesto – kale from Urban Oasis, walnuts, garlic, parmesan cheese, lemon juice, salt pepper. I think I like this new diet. I’m eating in moderation, period! Episode 6 of Da Vinci’s Demons becomes darker as we are introduced to Vlad the Impaler, aka Vlad III Dracula. Leonardo is still on his quest to understand the Sons of Mithras and his search for the Book of Leaves. The Medicis are in pursuit of alliances with neighboring kingdoms in their all and out acrimony with Rome and the Papacy. This afternoon I checked out CK’s swimming lessons. I am the very proud Grandpa, of course, and I am there with my usual camera… It was when I was snapping pictures that something sort-of strange caught my eyes and lens. 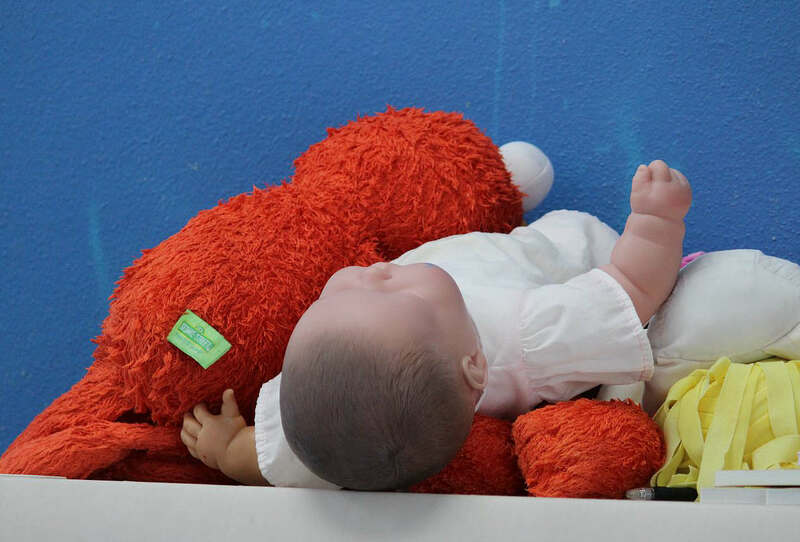 On a shelving unit the Elmo props and a life-like looking baby doll was stuck away in a heap. I really had to look twice. I must have been out of it for years… Are dolls now made that life-like or are my eyes ready for a new checkup? Internet speed upgraded to 90 Mbps. Needless to say The Pack all wanted in to find out what was going on. In the back - Taylor; right to left - Radar, Max, Bella, and Tinker. We want in!! !